Together with physician partners, NAVADERM provides the ideal organizational structures that maximize the productivity and efficiency of a dermatology office. We understand the complexities of managing a medical business and deliver innovative solutions that take each practice’s uniqueness into consideration. Our dermatology offices are well-run and seek to exceed patients’ expectations, allowing physicians to focus on quality medical care. NAVADERM negotiates with vendors as a group, allowing your practice to save on malpractice insurance, medical supplies, fillers, lasers, and other products and services. We offer an extensive portfolio of vendors and brand-name suppliers. In an environment of constant reimbursement rule changes, NAVADERM’s team of experienced coding and compliance professionals are committed to providing coding support. Our goal is to ensure that providers have the knowledge and tools to be fully compliant with documentation and coding that ensures optimal reimbursement and coding accuracy. Dermatologists are presented with many different opportunities to generate additional revenue or provide new patient services. Our business development team analyzes and develops plans to strategically grow the business. From new lasers, fillers, or other ancillary services, to adding a new location, our team of medical practice executives has extensive knowledge and expertise in real estate, marketing, financial analysis, and other areas needed to evaluate new opportunities. NAVADERM’s team of CPAs and accounting professionals provide accurate and timely reporting, financial controls, and sound budgeting to maintain the efficiency and profitability of your practice. With streamlined workflows, increased controls, and measurability, NAVADERM’s team of experienced customer service representatives provide an exceptional experience to schedule and reschedule appointments, follow up on available sales opportunities, and field phone calls for providers. NAVADERM’s team continually monitors changes in regulatory guidelines affecting required compliance at the State and Federal levels. From HIPAA to OSHA, we maintain staff and providers informed of any changes in the law, as well as, provide the necessary compliance and risk management training in order to maintain the business compliant. NAVADERM considers the practice's unique culture and marketing brand. We believe that the ongoing practice name and brand is an asset and look to enhance it, not change it. Our marketing philosophy is results-driven and metrics-oriented. Our team produces highly customized plans designed to meet your practice's unique needs. Marketing plans, advertising campaigns, and strategic plans seek to increase the practice's referrals and overall physicians' reputation. We follow up with advertising efforts that deliver measurable results. NAVADERM offers better benefits, minimized risk, and maximized employee resources across the organization. We provide human resource administration, talent management, employee benefits, payroll, and regulatory compliance. A cloud-based Electronic Healthcare Record gives the providers the freedom to practice dermatology virtually wherever and whenever. Our team manages integration, implementation, and training of support staff and dermatology providers. We assist providers in participating and succeeding with the Medicare Quality Payment Program and reporting quality measures under MACRA. NAVADERM’s team has decades of experience with managed care contracting and providing effective payer relation solutions. We develop a blueprint for success that includes insurance payer profiles, payer relations, contract negotiation management, and reimbursement analysis. Our certified Information Technology Security, Audit, and Privacy professionals provide end-to-end IT services. From Cybersecurity to HIPAA, our team provides a wide range of healthcare IT services related to the planning, creation, process and optimization of healthcare technology. With experience in integration, implementation and healthcare technology audits, NAVADERM’s team manages the full range of hardware and software services that seek to improve quality and lower costs. NAVADERM’s approach to recruitment is customized. 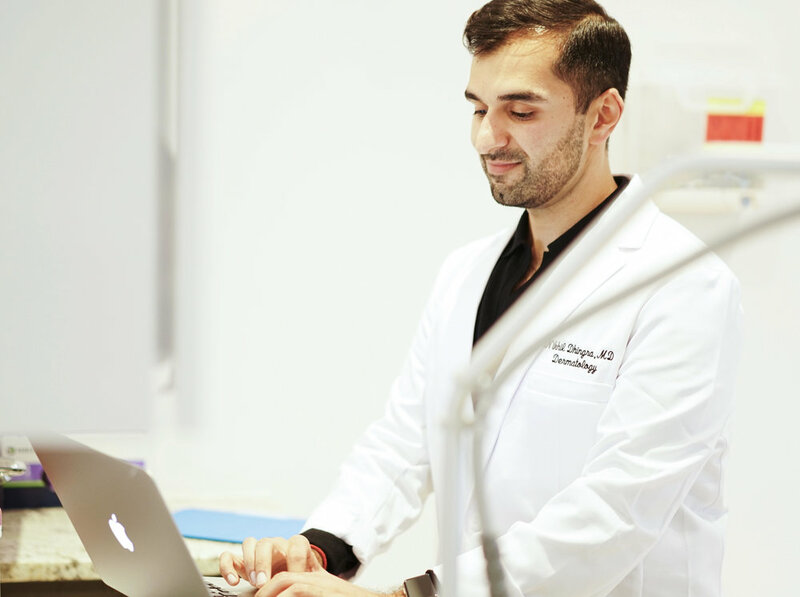 Our experienced team of recruiters know the dermatology industry, have access to training programs, and work diligently to find the ideal candidates for the practice's specific needs. At NAVADERM, we specialize in optimizing clinical and operational processes to enhance the practice’s revenue cycle management. We analyze and improve billing, collections, and accounts receivables. Using the latest technology, our team of medical billing specialists and customer service representatives manage all aspects of the revenue cycle: Patient Registration, Eligibility Verification, Charge Capture, Medical Coding, Electronic Claims Transmission, Remittance Processing, Payment Posting, Claims Management, Denial Management, Patient Collection Solutions, Third Party Follow-Up, Utilization Review, and Revenue Data Insight & Analytics. Establishing the credentials of providers is critical to maintaining eligibility with insurance and government health plans. NAVADERM’s highly experienced credentialing team ensures that providers are properly credentialed at all times. Offering the latest credentialing resources enables physicians to focus on delivering quality medical care. We manage credentialing for physicians, physician assistants, nurse practitioners, therapists and others licensed individuals. Services include: Application Management, Credentialing Database Management, Hospital Privileges, Delegated Credentialing, Re-credentialing, and Sanction monitoring.